Since 1985, DANIEL produces traditional faucets and quality single-lever mixers. The company turns to a demanding market, meeting its needs through its innovative suggestions, its constant attention to the product and its service, always impeccable. Besides, DANIEL has been bringing innovation for the last 20 years, aiming at originality and caring for targeted creations in order to meet the needs of the most demanding buyers. The use of the best materials, the processing, finishing and assembling techniques, nonetheless an impeccable testing, they all guarantee high standards and a perfect efficiency. DANIEL is synonym for research, design, study and technology and commits itself into spreading the “Made in Italy” all around the world. 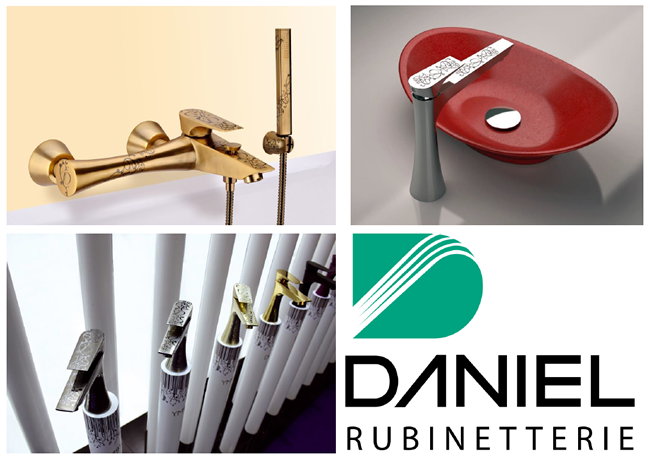 The fundamental purpose of DANIEL RUBINETTERIE is to offer a targeted and specific service to create wrapping atmospheres and furnish the bathroom zone.